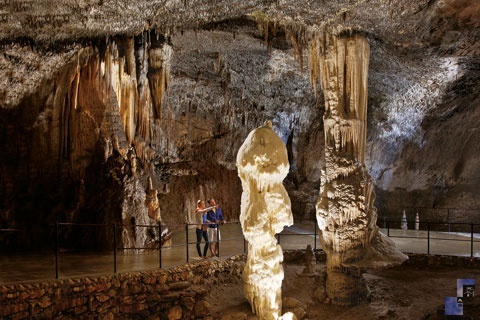 Visit the Postojna Caves, which are certainly the best-known tourist caves in the world. Here you can marvel at the sight of amazing creations in limestone sculpted continuously by water over a thousand years. There are around 5 km of tunnels open for tourists. At first an underground tourist train takes you through older underground tunnels; the way continues on a wel- maintained walking route through the most beautiful halls, where you can see proteus – the rare animal species, it is a type of amphibian, living only in underground caves – and on to the concert hall, where because of the outstanding acoustics concerts are often held. A visit to Postojna caves lasts an hour and a half, the temperature in the caves is up to 12 º C and therefore suitable clothing and footwear are necessary. Predjama Castle is located 10 km away from Postojna in Predjama village, cut into a rock face up high above the ground. It used to be the shelter of a knight by the name of Erasmus and that is why every summer a traditional medieval knights’ tournament is staged there. The castle is now museum and is open for tourist visitors as well. Did you know that in 1986 the actor Jackie Chan chose Predjama Castle for filming Armour of God? Surcharges: Entrance to Postojna Cave and Predjama Castle (34 € / person). The trip can be combined with a visit of Ljubljana.